This day beat me up. After a hard day yesterday, a poor night’s sleep and another difficult day today I am physically and mentally below my average. Again we start out pretty cool. Rich described it as bone chilling. I wore my winter jacket for the first 30 miles. 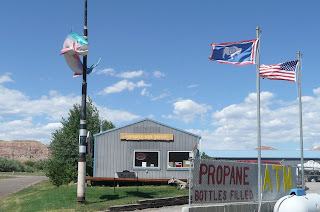 It eventually became very hot (90+) and dry when we reached our ascent to the continental divide. One of the sights in downtown Jackson as we exit for Dubois. Colleen, our 30 year old school teacher from Chicago went down yesterday on a 45 degree railroad crossing. She’s bruised and has some good road rash but is still riding and her spirits are good. Max seems ok. No other ride killing injuries. I was pretty tired today. 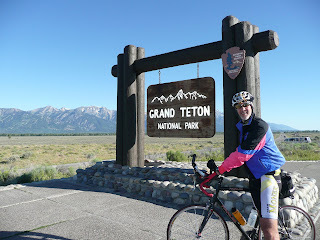 My legs did not have the oomph that I’ve enjoyed on other rides. I just didn’t feel like riding or peddling today. 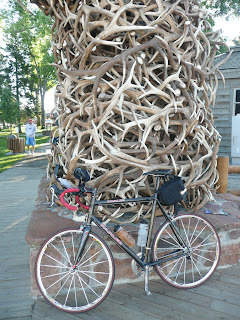 I was looking forward to the scenery and the majesty of this ride and was not disappointed in that category. 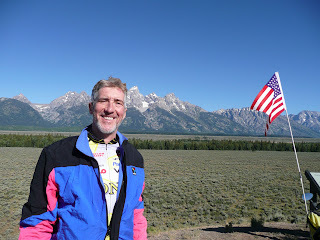 The highlight of the ride was the different views of the Teton Mountains and our tour of the entire Jackson Hole valley in Wyoming. I stop and take lots of pictures. The internet doesn’t work so well here, so I am not able to download the blog tonight. Sorry Mom, maybe tomorrow. The climb was not as bad as yesterdays, or the ride from Prineville to John Day Oregon, but I started out without a lot of zeal and enthusiasm for riding. Allois and I rode together for the first 40 or so miles until the climbs separated us too much. I couldn’t keep up with him today. The big disappointment was road construction. 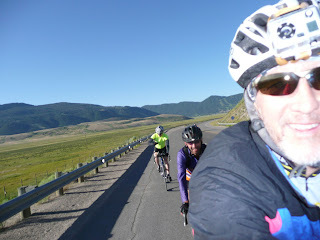 We went through two miles of dirt, gravel and new asphalt on our own in a level section of the ride prior to our ascent. The Ascent was made more difficult by the addition of strong headwinds today. I really don’t do well in them. Then, after 11 miles up to the top at 6 to 10% grades we were told that we had to be shuttled down the mountain through what turned out to be 10 miles of torn up road. Thus we didn’t even get to enjoy the descent, our reward for the big effort to get to the top. Our big reward today was the scenery. I took lots of pictures, see the bottom. That was the first part of the ride and it was fun. The hills and headwinds were not fun. Another nice thing happened today after I was separated from the guys I have been riding with. Marianne Ronay, who I have not ridden at all with yet ended up setting my pace at the end. She kept me company and helped me set a pace. 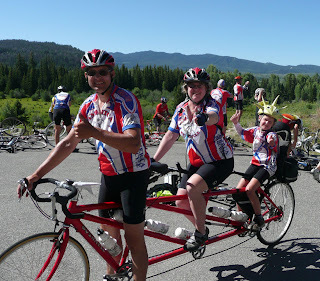 We worked together to fight the strong headwinds of the last 15 miles of the ride. 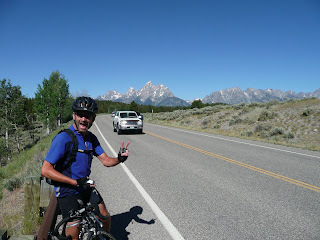 These last fifteen were in very strong headwinds which I estimate were 30 mph+. Flags were straight out against us. Marianne is a very strong rider from Riverside California. She is a nurse who teaches doctors about family medicine. Marianne nursed me in and treated me to a chocolate milk and cookie at the end of the ride which I am very grateful for. In the town there is a neat western feel. 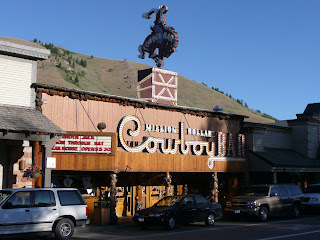 This really is a cowboy town. Many of the guys are in boots and cowboy hats. 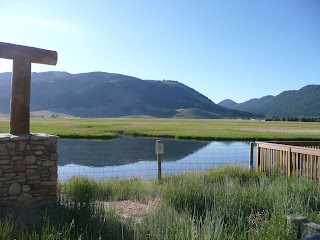 The area we rode through was full of real ranches with people riding horses to herd cattle. Tonight, being the third of July the one local establishment is having a square dance and the place is packed. It’s now 9pm and Rich is out cold. As soon as I finish this I’m getting ready for bed as well. Our hotel has no air-conditioning and is right next to the bar. I hope the local carousing doesn’t keep us up. The tri - motor made it through the first half today. Will climbed the mountains solo. My new computer background. Look at Rich's shot of this with the guys fly fishing, even better! 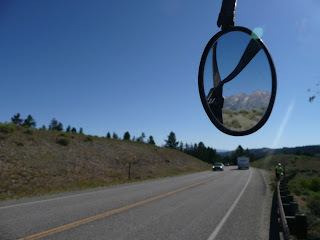 I thought I'd give you a peek at what we saw for most of the morning in our rear view mirrors. It was an awsome sight. Bravarian Allois was in a very happy mood. He loves the hills and unlike the rest of us, he was supercharged by them. He kept saying it reminded him of his homeland. He's been away for 5 years testing BMW's in Southern California. We all felt really sorry for him. Not the wildlife we see going to get ice cream in beautiful UA. 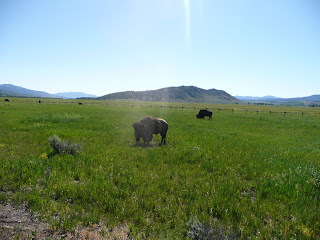 These big guys were right along the side of the road, no barriers to us or anything. Not to worry mom, once they started charging I got on my bike and road like crazy. I didn't throw anything at them, I swear! I made a tactical error buddying up with the two best climbers in our group. Allois Gaigl and John Hubert. 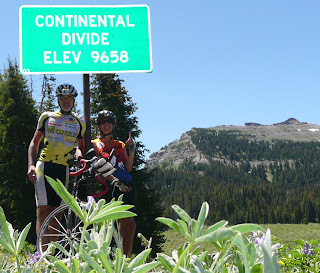 I didn't last long once we hit the long ascent to the continental divide. I look good here. They let me pull to the hill and then seeee ya! 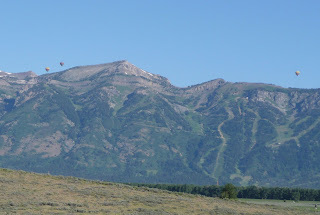 We watched these hot air balloons ascend and descend as we rode through Jackson Hole. The Elk herd's winter home. We didn't see many. Eagle eyes John Hubert (air force and airline pilot) spotted some in the trees, but I never saw any. 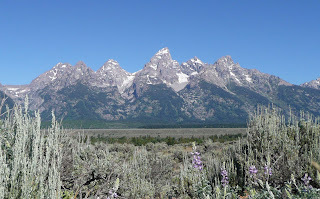 The Grand Teton Mountain from our roadside view. Kind of like riding out to the Dutch Kithcen? 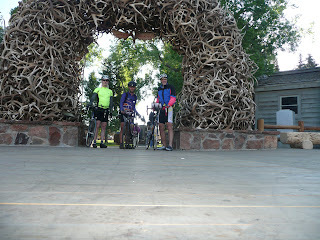 Mariah and the antler arches. Jackson WY Boy Scouts collect these and auction them off as a fund raiser. An arch goes for something like $300,000! 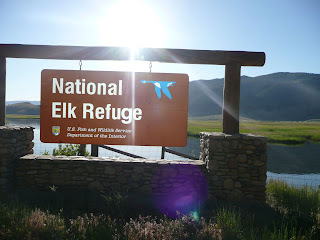 There are 11,000 elk in the herd and the Scouts simply collect them and build these each year! Four arches surround the local park. 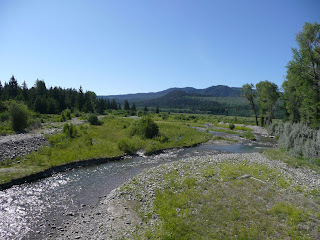 Fly fishing is really big here. Notice the stiff flags, they were going exactly against us today.